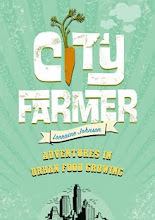 On Wednesday, October 12, I'll be reading from City Farmer: Adventures in Urban Food Growing at an event sponsored by the Beaches United Church. (Admission is free but donations are encouraged to support Goodwill's Interfaith Lunch Program.) The reading starts at 7:30 and is being held at Juice and Java, 2102 Queen Street East (Queen and Winona), Toronto. Hope you can make it!